It’s neither quick nor easy to create great-looking Avenue Q character puppets that also work effectively on stage with your actors. Designed and fabricated by the experts who brought you the Audrey II plants, our complete set of 26 puppets (11 practice puppets and 15 performance puppets) are available to rent for your theatre's production of Avenue Q or Avenue Q School Edition. 26 puppets (11 practice puppets and 15 performance puppets). Since almost every puppet has at least one costume change during the show, we provide an in-depth schematic, detailing which puppets should be used for each scene, and what clothes they should be wearing. Puppets such as Rod and Kate have hands, and are operated by a two-rod system. 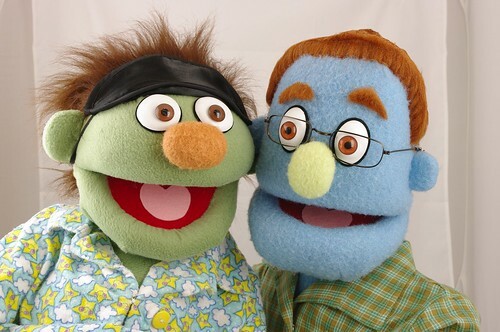 Others, such as Trekkie and Nicky, are "live hand puppets" that utilize the puppeteer's free hand as the hand of the puppet. In addition to the performance puppets, you will receive a set of practice puppets for use during rehearsals and for actors to practice with at home. The Rehearsal Puppets will ship six (6) weeks prior to your opening date. Performance Puppets will be shipped separately, approximately three (3) weeks before your opening date. Once you receive your Performance Puppets, the Rehearsal Puppets must be returned. Base Price: $2000 for an eight (8) week rental and $350 for each additional week (eight week period is split between time with rehearsal and performance sets). Security Deposit: $500 security deposit. *For shipping to HI and AK Please call your representative for specifics.